... I send my best wishes; to readers whoever and wherever they are. Especially, if they read this, dear long-time friends at Papa Stronsay, and Sons of S Philip Neri, and citizens of the mighty Lone Star State. And the elegant and beautiful city of Copenhagen. And to more recent friends at Silverstream and in Dublin; as well as to those I have met through the Roman Forum, and that great engine of the New Evangelisation, the Latin Mass Society together with its Latin Summer School, and at Knock. 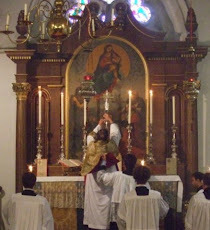 Brothers and sisters in the Ordinariate of our Lady of Walsingham, and fellow-members of the Confraternity of Catholic Clergy: that almost goes without saying. All who have contributed comments to this blog ... yes, I mean you. Benefactors who have given me books, articles, and hospitality. Come to think of it, quite a lot of overlapping in this list! And - a very special category - my love to those who kept me going in the dark months after, having entered into Full Communion, I immediately ran into a cruel wall of hostility and rejection. I shall particularly pray this Pasch for the Franciscans of the Immaculate, whose problems have already lasted more than twice as long as mine did; and for courageous bishops who, at personal risk, have given some of the FI a refuge. But I would also like to greet, if I dare, readers who are still within the Church of England, and who can read this Blog without being too angry with me. Ecumenism means nothing if we entertain vacuously kindly thoughts about ecclesial bodies theologically far distant from us, while feeling irritated towards those who are so close that you couldn't get an old-style cigarette paper between us. And this means: those who held with us the fulness of the Catholic Faith, yet remain for the time being the other side of the Tiber. I sometimes feel that some who regarded themselves as 'papalists' when we were all together, seem to have been driven to a more distant ecclesiology by beholding us in Full Communion with Peter. I pray that my own words have not been, and may not be, a skandalon. God bless you; may God bless us all. Thank you Father. That was very kind of you. Have a joyous Easter. God bless you, Fr. H! And thank you for all you do. A blessed Easter to you, your family, your friends, and readers of your important blog. Thank you, Father. May you and your family have a Blessed Easter. Also, thank you for becoming a priest and reuniting with Rome. God Bless you. and Paschal greetings from at least one Orthodox Christian who reads you with some regularity. Easter greetings from a fellow traveller! Prospera Pascha tibi sit, pater, et omnibus vobis qui legunt hoc! And our thanks to you, Father, for your faith, courage and example! I suspect many of us have received much more than we have given. Happy Easter and ad multos annos! Well, since I was showing off with Greek and Latin, it would be best if I posted a correction as well. The "et omnibus..." should have said "et omnibus vobis qui legitis hoc"! A blessed Easter from your Pantasaph Latin student of the Thin Blue Line! As the Woody in Texas I heartily associate myself with the other Woody's sentiments snd pray that before another Easter comes, we may see you at Walsingham in Houston. Happy Easter to you and your family, et ad multos annos, Father.